Divoom moves forward in their tradition of audio advancement by announcing another tough model which is known as the Divoom Voombox Outdoor. 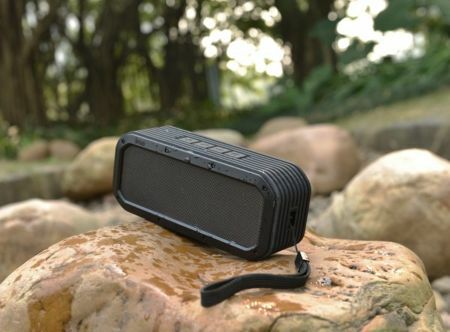 This happens to be a rechargeable, water resistant Bluetooth speaker that has been specially designed to work even in rugged conditions, all the while delivering a 12-hour battery life as well as a powerful 15W of output power. Not only is it portable, it is also versatile to boot, where the Voombox Outdoor can be used in any environment – regardless of whether it is indoors or out. To make sure that you stand out from the crowd as well, it will arrive in a range of colors such as red, blue, black and green. The asking price of $99.99 a pop for the Divoom Voombox Outdoor would certainly fall within the means of many an audiophile, and considering how travel has gotten a whole lot more affordable these days, having fun with your favorite tunes playing in the background makes plenty of sense, really. The Divoom Voombox Outdoor has been specially built for the outdoors, where it is more than capable of handling a rugged lifestyle. We are talking about rough and tumble environments such as when you go camping, fishing, and backpacking, among others. This particular weatherproof speaker comes equipped with the most recent Bluetooth 4.0 technology, where it will be able to hook up wirelessly to a compatible smartphone, tablet or any other Bluetooth device within a range of up to 32 feet. Not only that, the Divoom Voombox outdoor will also feature a pair of 2” drivers, one tweeter and two passive radiators. These 5 drivers will work in tandem to deliver a clean sound pressure level, capable of filling up large rooms and outdoor areas with rich immersive sound. A campfire session without any favorite tunes playing in the background is not quite the same, is it, unless you know how to handle a fiddle.